Mitochondria are the powerhouses of oxygen-consuming organisms and respiratory complexes are the very turbines of this powerhouse. Basically they are catalyzing an oxyhydrogen reaction with the energy not being released in a bang, but being stored in chemical form. Respiratory complexes are made from many subunit proteins and the elucidation of their structures was a major achievement in structural biology. Thanks to cryo-electronmicroscopy higher aggregation forms of these complexes become accessible to scientists. The inner mitochondrial membrane, the place where respiration ultimately takes place, is tightly packed with proteins. 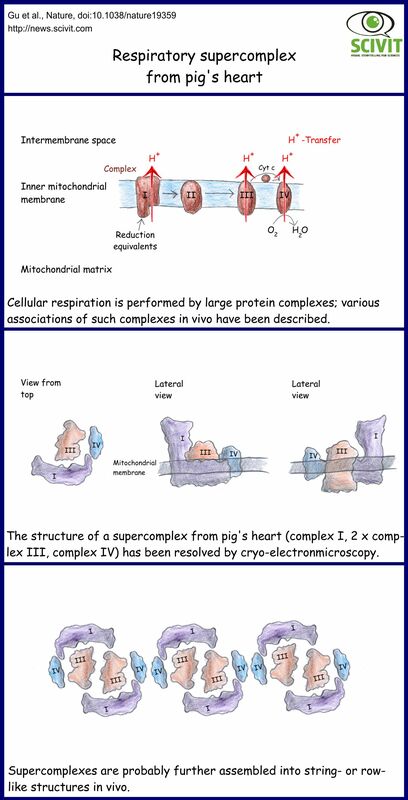 Given the fact that the energy liberated in respiration is stored in a proton-gradient across the inner membrane, a thight package of respiratory complexes makes also sense energetically. Complex V has been demonstrated to occur in dimeric rows along the cristae (http://www.scivit.de/lang/archive/634). For the other complexes there seems to be more flexibility and various supercomplexes could be isolated so far. The structure of the most prominent, mammalian-type complex has been elucidated by Gu and colleagues. Ultimately also these supercomplexes seem to be arranged in strings or rows of higher steric order in the inner mitochondrial membrane (Biochimica et Biophysica Acta 1787, 672 – 680, Biochimica et Biophysica Acta 1787, 60–67).